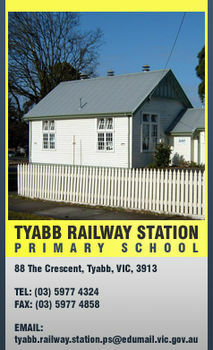 Tyabb Railway Station Primary School is a unique school offering an outstanding and differentiated learning and teaching program, made possible by the experienced expert class teachers in all grades which ensures a happy, stimulating learning environment. The home-school partnership is valued as indicated by our excellent Parent Opinion survey results. Enviably well resourced, our school buildings are about to be significantly upgraded. We offer a school wide sequential learning program within Numeracy and Literacy, based on a strong emphasis of individualised assessment. Our units of work are multidisciplinary promoting inquiry and the development of higher order thinking tools. We are proud of our enrichment/support programs and diverse range of extra curricula activities. The specialist programs include Health and Physical Education, Visual Arts, Performing Arts and ICT in well resourced facilities. Tyabb Railway Station PS has a strong emphasis on student wellbeing, with students, families and the school community having input into promoting the school values and the You Can Do It! Program. We are proud that our school is committed to maintaining and improvingon our outstanding educational programs, facilities and resources for the benefit of our students.